G-Tek® PolyKor™ Engineered Yarns optimize performance, function, and protection by blending select fibers to exceed industry standards.G-Tek® PolyKor™ delivers value by providing Safety Managers with an affordable, cut resistant alternative that will help to reduce hand injuries. G-Tek® PolyKor™ is engineered to deliver the protection Safety Managers require, and the fit and function workers prefer – all at an exceptional value! These New A5 Level Cut Safety Grip Gloves are available in two different coatings - nitrile and polyurethane. The G-Tek® PolyKor® 16-635 and 16-655 styles have a nitrile coated MicroSurface grip on palm and fingers to provide a superior grip in dry, wet and oily conditions. The double-dipped nitrile coating on the 16-655 extends the life of the glove by improving abrasion and oil penetration resistance. G-Tek® PolyKor® 16-645LG and 16-665 styles feature a polyurethane (PU) coating on the palm and fingertips, which offers great dexterity and tactile sensitivity along with good wet/dry grip. The 16-645LG was designed with hi-viz coloring to fulfill work applications that require hi-visibility or when workers hands can become camouflaged within their work environment. The 16-665 is blended with aramid, which allows the glove to be used in light heat resistant applications and where sparks may be present. 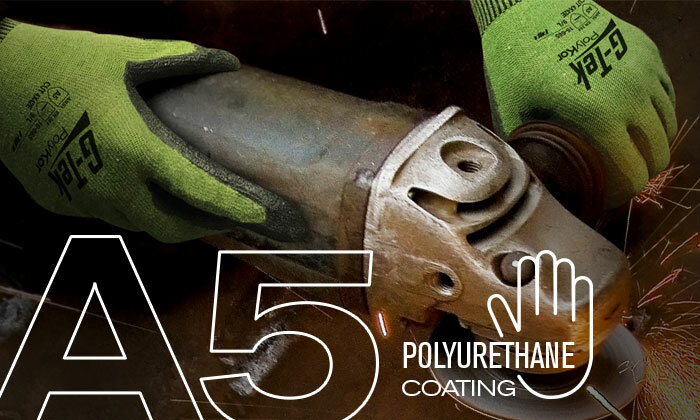 These PolyKor A5 Gloves are ideal for use in glass cutting, metal handling, sharp parts assembly and construction applications. Contact MDS for volume discounts, samples, PIP® custom services (imprinting, vend-ready packs etc.) or to place an order today!